Each fall to date, my schedule and stress level have turned a gentle corner together into greater peace. This year, my daily schedule has not yet relieved, but my mind has calmed. Here are things I’m grateful for this season. Modern appliances – what would I do without my fridge? Or my coffee pot? 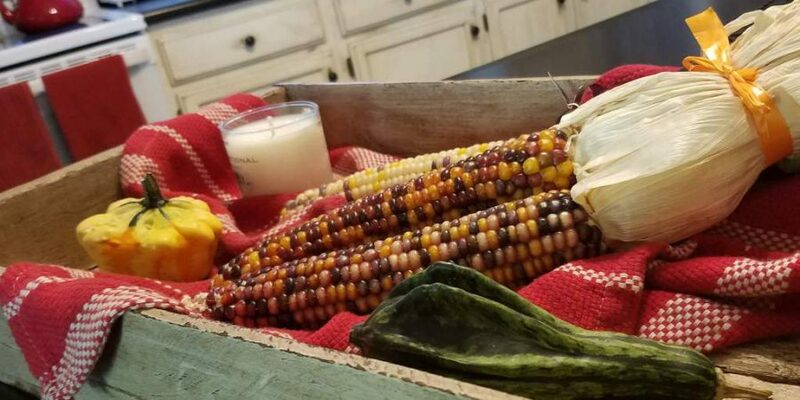 Fall décor – like pumpkins and Indian corn – my favorite! Previous Post Shari’s Amazing Household Hacks! I love your list of gratefuls Shari. 1. My husband Tim wasn’t killed in the car accident on Friday that totaled our car. 2. The overwhelming generosity of our church offering to let us borrow a car until we can find one. 9. Dollar Tree for having Rice -a- Roni so I can add chicken for a complete meal. 19. Crochet hooks and yarn for making lovely creations. 20. Slow Cookers. They have been lifesavers on so many occassions. This list is so wonderful! Would love to hear your list of ‘sad music’ 😉 very interested…. Mmm. I think the ones they had in mind were classical, some of the softer and mournful pieces like Adagios or Mozart’s Requiem or Chopin’s Waltz 69. I have also found crying songs healing overall, especially guitar music and voices of the Simon & Garfunkel variety. Something about it lets the sorrow escape your heart instead of being trapped inside. My husband, Andreas; he’s extraordinarily good to me and the children. My sisters are coming to visit; they rarely do. My children, who do adorable so well. My church, full of real people. Clean windows, and Stephanie, who gets the credit for that. I am grateful for children, travels, friends, quiet corners of the world, home, rest, sleep, good reports of our children’s behavior while we were gone, snow and the beginning of a new season! I am grateful to Jesus that a Tremendously Stressful situation with our foster care agency has turned a corner and that we are known to be people of integrity.